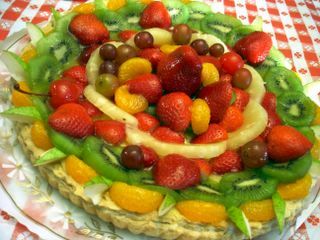 That is a BEAUTIFUL looking fruit tart!! God i love that stuff...Haven't had it in a while and now I'm craving it. Hi elmo! I feel the same way about oversweet desserts. Have you tried Sing Sing Bakery on Bolsa Ave? It's directly across the street from TK Market mall (the Viet Costco). Their fruit tarts are my favorite. And it tastes as good as it looks! Although the fresher it is the better since the crust gets soggier from the custard the longer you wait. I didn't know about Sing Sing. I'm gonna need to check this one out! Thanks! Ha Ha, I know what you mean about the Vietnamese (and other Asian) ways of "queueing"...I learned my lesson the hard way once at a bahn mi shop. Amen on the subtley sweet desserts--so much better than the stuff that makes your cavities hurt. I make it a point to buy my treats, even the more Western versions like cakes and tarts, at Asian and Latin bakeries! Right there with you! It was also a banh mi shop that made me realize it's survival of the fittest. But no matter how chaotic the lines are, I'm standing in them. Nothing good ever comes easy! Have you tried that new bakery in the Callens Corner (Ralph's in FV) center? Haven't tried that bakery. What items do they do best? I haven't tried it yet myself. Not being a sweet eater, I'm generally not inclined to just go into a bakery 'to see'. Maybe someone else will let us all know.